We're wanting to take our current "Quote Form" to the next level in hopes to make it more automated and complex for capturing information and preparing an invoice. 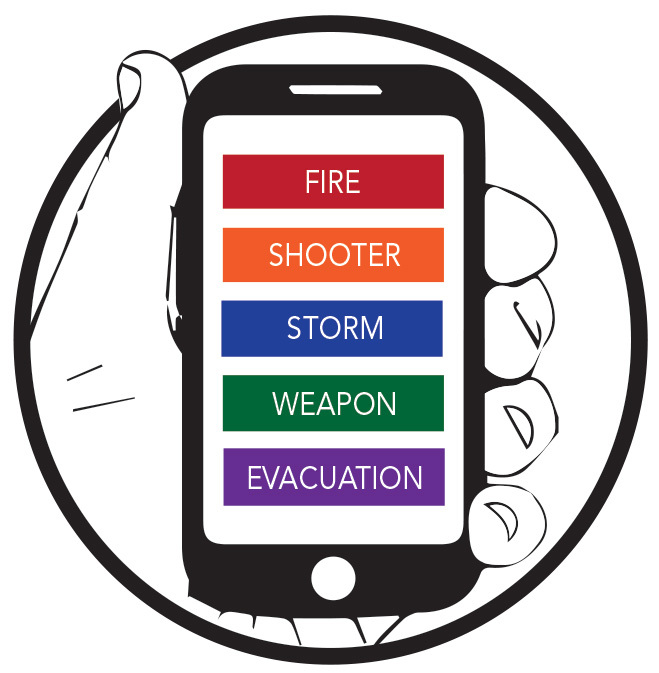 We're currently getting requests through our basic form for our product, the Mobile Emergency Response Plan, but we want to make the process more automated so that there isn't so much manual work to put information into invoices and quotes. Step 2) Be able to choose the right plan, then they have 2 options: "Yes, Get A Quote" or "No, Not at This Time." If they choose "no," the information still gets sent to our email. If they choose "Yes," we want the information to automatically fill into a quote form (similar to an invoice) that is sent to them so they can process for payment. I did some research, but haven't set up a form this complex so I wanted to reach out to see if all these functionalities are possible with JotForm. It seems that your requirement is achievable. Since, you need the information sent to your email irrespective of choosing to get a quote or not, setting up a notification can help you. If the invoice is just the content to be displayed along with the captured information to send to the customer, we can create a Form Auto-responder and customize it. This email can be sent to the customer only if he chooses to get a quote by setting the condition from Conditions Wizard. 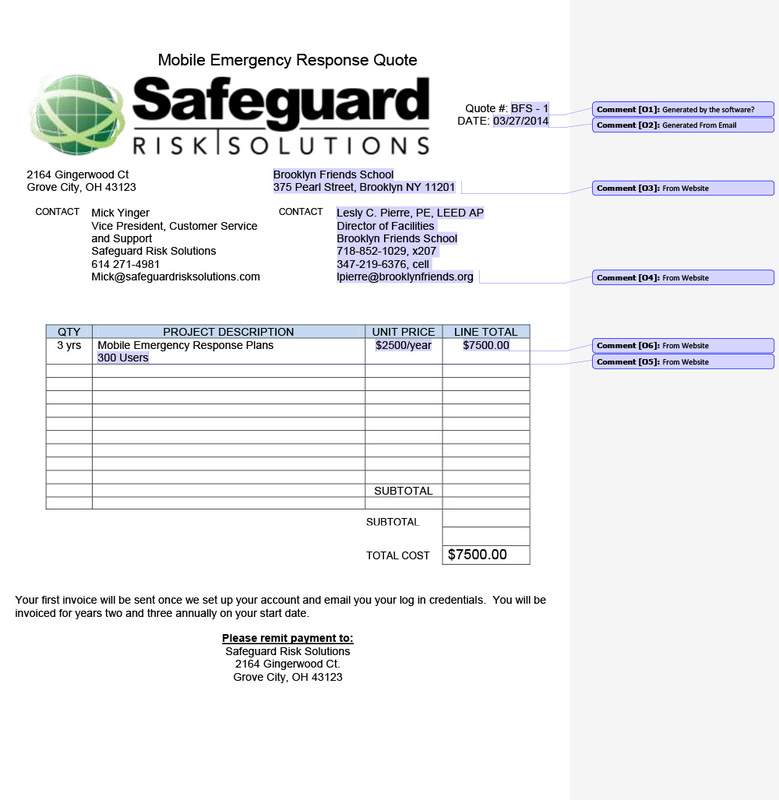 If you can share us with the invoice template pdf, we will take a look and see if we can help you as possible we can. Please let us know if you have any other questions. We will be happy to help. I have attached an image of what we'd like displayed on the invoice that's sent to the client. I'll look into the first steps that you mentioned above. Let me know if you should need anything else or if you have any questions for me. Please allow us some time to look this over and see what we can come up with. Thanks! Let me know if you need more information or anything else from me. I took some time just now and have devised a similar formatting set up using the template tools we have at hand to generate a close appearance. The only problem though is that some it still retains the table format instead of what you have in your image so I'm not sure if that would be okay or not. For quote number I think your best bet would be to use our platform to generate a unique id which can be placed there. I will take some more time and get back to you after I try to clean this up more. It will likely take some further time using the HTML Formatting instead though if possible. Thanks for the help on this, Kade! I've been working on the new form to better suit the new functionalities. Can you import the invoice template into that so I can look into it? not sure if this would be too advanced, but we have an options for "More than 5001 employees" which is $1.25 per employee. Is it possible to set it up so that if someone fills in a number more that 5001, it automatically adds the cost up? Thanks again for you help! Much, much appreciated! I believe that you are referring to Clone of Order Form when you say new form. 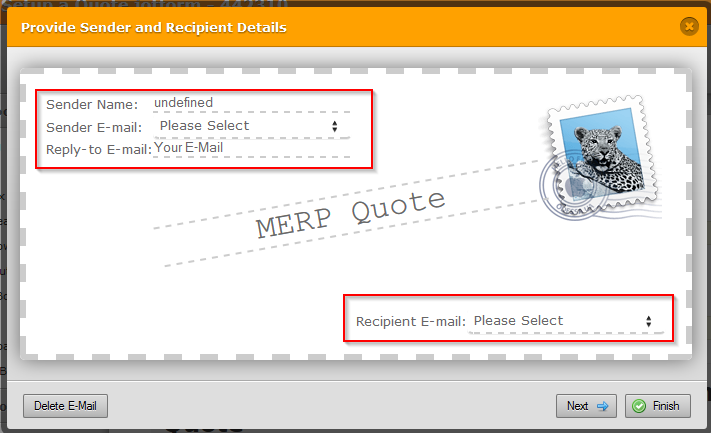 As requested, I've imported the invoice template to your new form as an autoresponder and named it as MERP Quote 2. 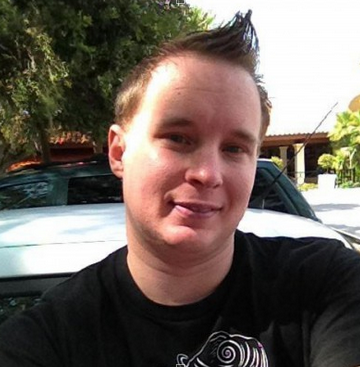 It seems Kade is still working on a possible solution for this. As soon as he figured out something with the solution, you'll be updated here. I've moved your other question with calculation to a new thread and shall be addressed there. Hi Kiran, thanks again for you help on all of this! You're correct, I was referring to the Clone of Order Form. Please let me know when Kade has an update on the invoice and we should be close to getting this all wrapped up! I appreciate the help and great support you guys have provided. Sure. We'll get back to you at the earliest with a possible solution. Thank you for your patience. Our form "Clone of Order Form" is all set with the fields and pricing updated. All we need now is a way to make the fields auto fill into an invoice when the user clicks "Get A Quote." Let me know if we can utilize what Kade has already started working on. Great!! Sorry for the delay. Let me check it out and see what best I can do for you in this regard. I'll get back to you on this as soon as possible. Thanks. All we really need now is for the Total cost to appear on the invoice along with a unique quote number. Please accept my apologies for not getting back to you about this issue previously. I had been working on a template but had to scrap it because I ran into an issue when I was testing it. It should have worked since it was just plain html but I must have made a mistake on it. So I am very sorry about that as it was the reason for my delayed response time. Anyhow, to add in your total and your quote number you just need to go into your notification and look inside the form field box on the righthand side then click on the Quote Number to get it's tag as well as your Total cost. If you click in the spots you want them to go in the template once you click on the coinciding field it will be placed there automatically. This will put your form data there. I've modified your JotForm and the template provided by our colleague a little so that the fields are autocalculated. Please check the JotForm to see if it works for you. 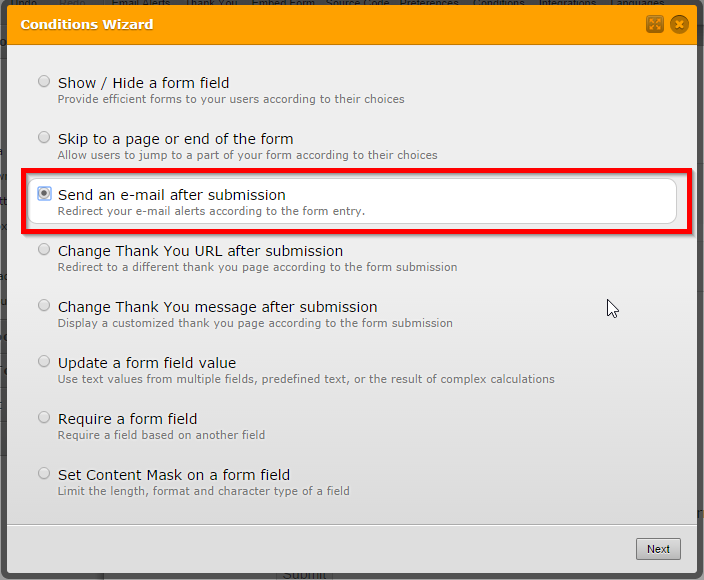 You may also clone this JotForm to your account for making any modifications. Please get back to us if you have any other questions. We will be happy to help. Thanks for the extra work on this Kiran! Looks like we're just about there! I'm making some final adjustments. When someone clicks "Get A Quote" and the email invoice comes through, is there a way to make that printable as well? It seems Kiran was able to fix some previous flaws so I'm happy to see this worked out to your advantage then and you're very welcome. For your follow-up question asking about printing I've moved that to a new thread here. Kiran, I copied the form over but something didn't seem to translate the same. I believe the conditions are off some how. When I tested your form, everything came through great. But when I copied it over, the total cost conditions didn't work right. Can you take a look and see what's different? Thanks. We're so close on this! You have added a new condition to your jotform which is causing the Total Cost Per Year field to be shown when you select 0-100 users and for over 5001 users, while it should only show up for over 5001 users. Removing this condition will help you to have it working properly once again. Thanks Ben, is it possible to separate the actions of 2 Submit buttons? We'd like "Get A Quote" to send them the invoice, and the "No, not at this time" button to send us an email with the information they filled out. Please leave future responses in regards to this setup there and we will be shortly answering you there as well. Got it. Thanks Ben. I'm still having some trouble getting this all wrapped up. I've cloned the form that Kiran put together (which worked great), but when cloned and tested, the emails aren't coming through and some conditions got jumbled up. I cloned it over, but did not make any changes. I see that the sender Name and Email, Recipient Email is not selected with appropriate options/fields which is causing email issues. Please fill in the necessary information in the fields required to receive emails. And I see that some actions from the of having more than 5001 users are removed. I've added these actions back in your JotForm. This condition should be working fine now. I filled in the email fields, but it still doesn't seem to be working....any ideas why it's not coming through? Please disregard the last message. I had to edit the conditions and figured it out! Great to hear that you got it to work. Do let us now if you have any further questions and we will be happy to help.